Yalla! has become the cry of the Arab world in the past few months. Raised by the powerful and eloquent voice of Mona Eltahawy, yalla calls on Arabs around the world to “hurry up” and make democracy happen. Since December 17, when desperate Tunisian Mohamed Bouazizi set himself on fire, the willingness of Arabs everywhere to risk their lives in hopes of democracy has flourished. Tunisia, Egypt, Jordan, Yemen, Bahrain, (also in Bahrain) Algeria, Palestine, Iran, Iraq, and, of course, Libya, have shown the world the spectrum of people power. Because of the success of the Egyptian Revolution and its high-profile nature there are many more sources of information regarding what happened, and what is happening there. 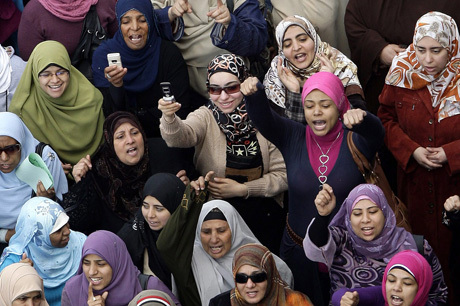 For this reason, and to pay tribute to Mona (who in a single hour of class taught me more than most people ever have), today’s post for International Women’s Day will focus on the women of the Egyptian Revolution. These photos showcase what an active role women have taken in demanding an end to Mubarak’s 30-year dictatorship and demanding equality for all Egyptians. From the beginning of revolutionary action international audiences questioned how involved Egyptian women were in the nonviolent actions and what their fate would be after the fall of Mubarak. News reports of “chaos and unrest” quickly changed their language when Mona Eltahawy schooled CNN to “call it a revolution!” From then on the media have accurately labeled the events in Egypt an uprising of democracy. Women’s experiences of the activism in Tahrir Square were unlike anything they had ever experienced, and until the brutal sexual assault on international journalist Lara Logan, women stated they were not being harassed and actually felt safer in the streets. 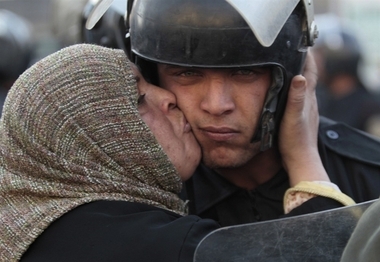 The brave Egyptian women (and soldiers) who rescued Logan are a testament to the courage and will of the women of Tahrir Square. Their actions, and the actions of the millions of women who took to the streets and engaged in strategic nonviolent action, have shattered the myths about complacent Arab women and paved the way for women of many other Arab nations to stand up for their rights. Follow Egypt’s example: learn about strategic nonviolent conflict and stand up for your own rights! P.S. In honor of International Women’s Day the Feminist Majority Foundation is hosting a FREE 1 hour webinar on International Family Planning at 1900EST. Go here to register. This entry was posted on Tuesday, March 8th, 2011 at 11:32	and tagged with Activism, Algeria, Bahrain, Egypt, International Women's Day, Iran, Iraq, Jordan, Libya, Mona Eltahawy, Palestine, Tunisia, Women's History Month, Yemen and posted in Race/Ethnicity and Activism. You can follow any responses to this entry through the RSS 2.0 feed.